Smoking using the Minion Method using a mix of apple and cherry wood (5 pieces total). 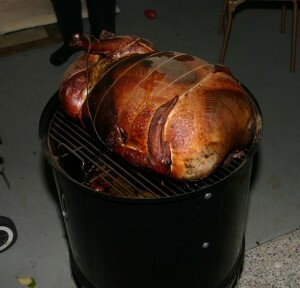 5:30pm – 170F internal temp. 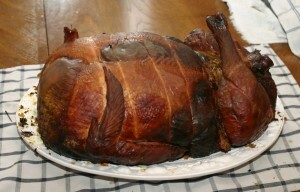 Smoker temp 290F. Vents @ 100, 100, 100 Removed from smoker! 6:30pm – 178F internal temp. Started carving & eating. *** Added 1/2 chimney of hot coals & cold water since the original coals were on their last legs. 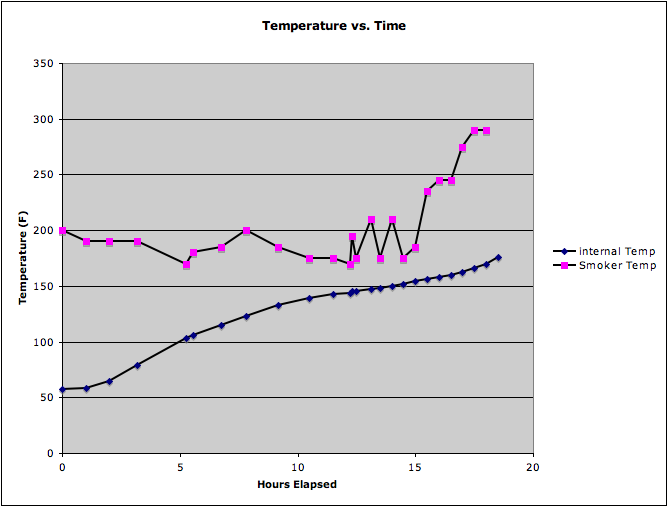 Smoker temp jumped to 250+, but quickly started going down after closing the vents. Also closed the top vent 50%. 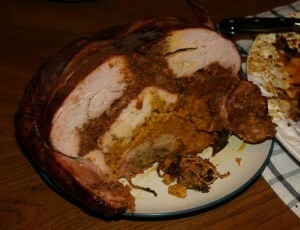 Other then taking 3 hours longer then planned, the turducken was great. There was enough smoke flavor that you could taste it, without it being overwhelming and complimented the spicy sausage based stuffing that was used. The meat was very moist and the outside layer of skin had a crispness to it that I didn’t expect and nice deep smoked color. Everyone seemed to think it was well worth the wait.